Dhruval Patel from Nagpur, B.E. - B.Tech Graduate. ENTERPRENEURIAL ATTI.. TEAM WORK SOLUTION FINDER MAN MANAGEMENT AND M..
are one of expert skill area's of Dhruval Patel . 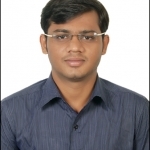 Dhruval Patel is working in Production/Manufacturing/Maintenance industry.